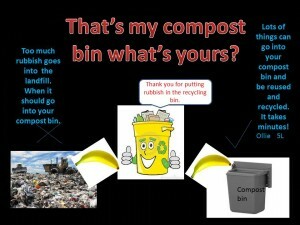 My special poster is about composting in the right bin. Here is one of my slogans from the my poster. Lots of things can go in your compost bin and can be reused and recycled. It takes minutes. Landfill doesn’t connect with compost bins because if you put landfill stuff in the black bin its just a waste. Also landfill is just a dump. But I did this poster because I don’t put food waste in the black bin I put it in the brown bin.